There is minimal plastic and a sturdy box, which is wasted because once you've assembled your robots they don't fit in it for storage, and aren't designed for disassembly. 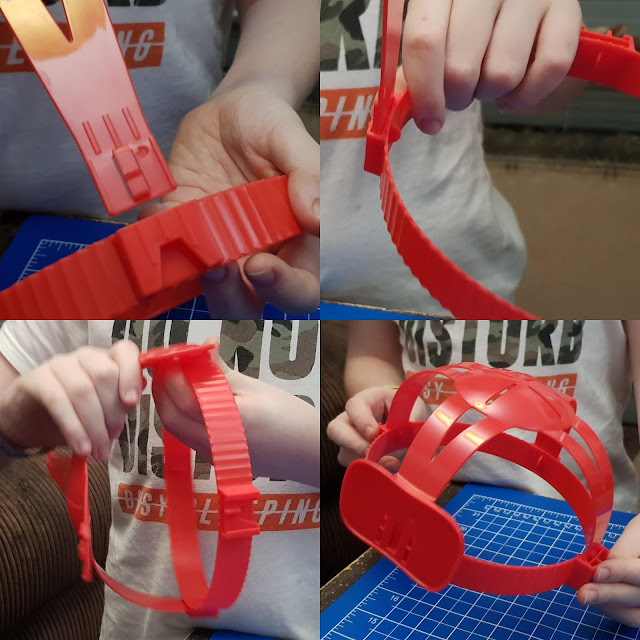 Assembly is quick and easy though, and actually quite exciting. 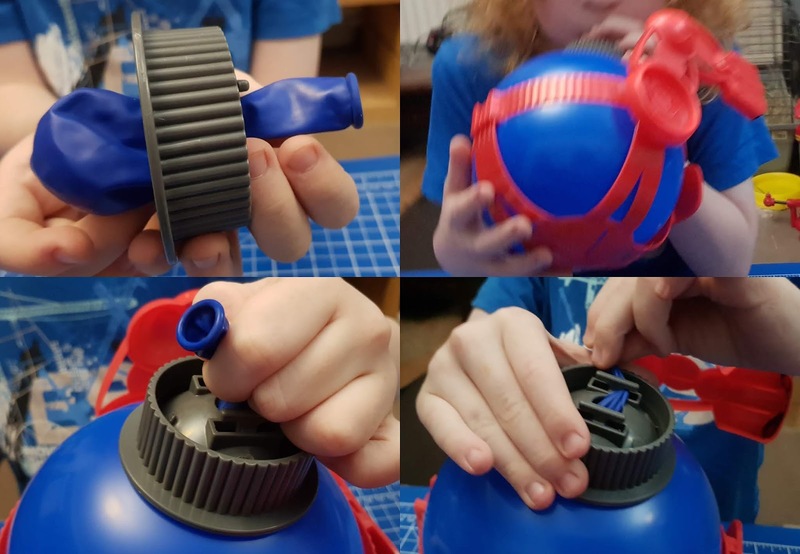 Inside the box are all the parts for 2 Balloon Bots plus 20 balloons, stickers and instructions. 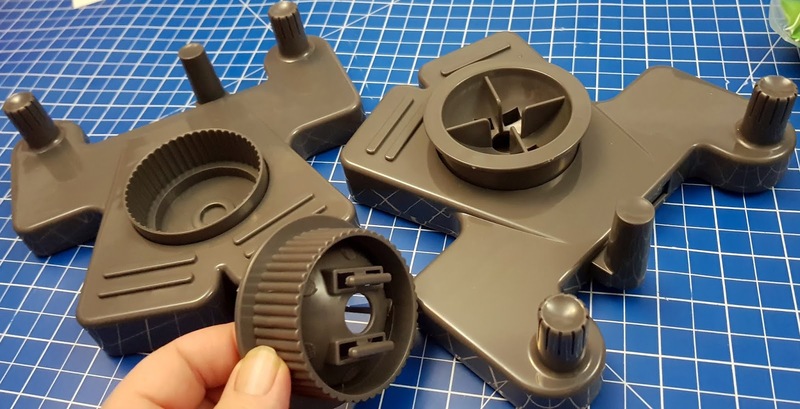 Assembly is fairly obvious as long as you start with everything turned the right way. Your robot is in 2 parts plus the balloon. 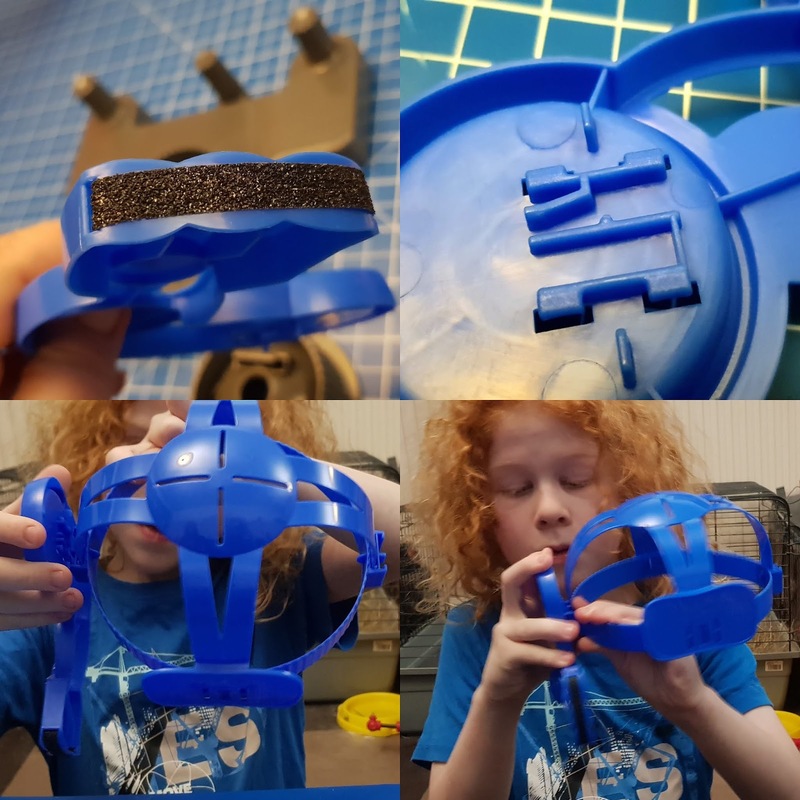 The hat/frame and the base, which has a joystick handle which you slide from side to side to move your robot and make him punch. Place the balloon into the hat frame and slide the neck of the balloon into the turning part of the base before you blow it up. 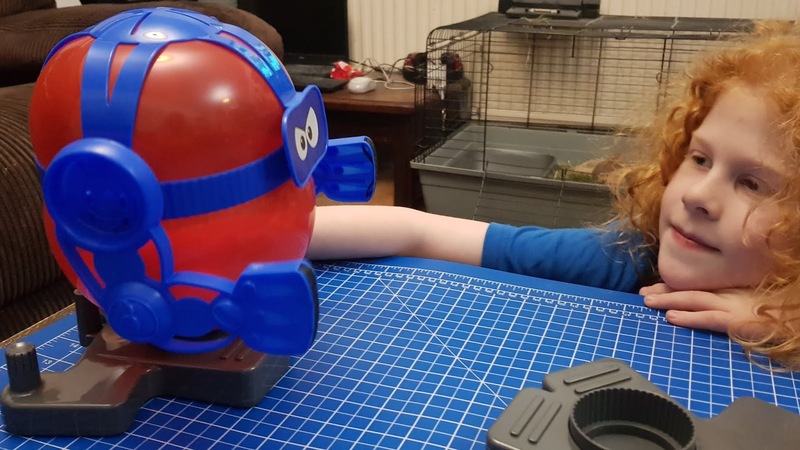 Inflate until it's beginning to squeeze a little and then you don't need to tie it off because it wraps around, so children can do it alone. That just sits into the rest of the base. Set up takes only 5 minutes and you are off - Round 1! 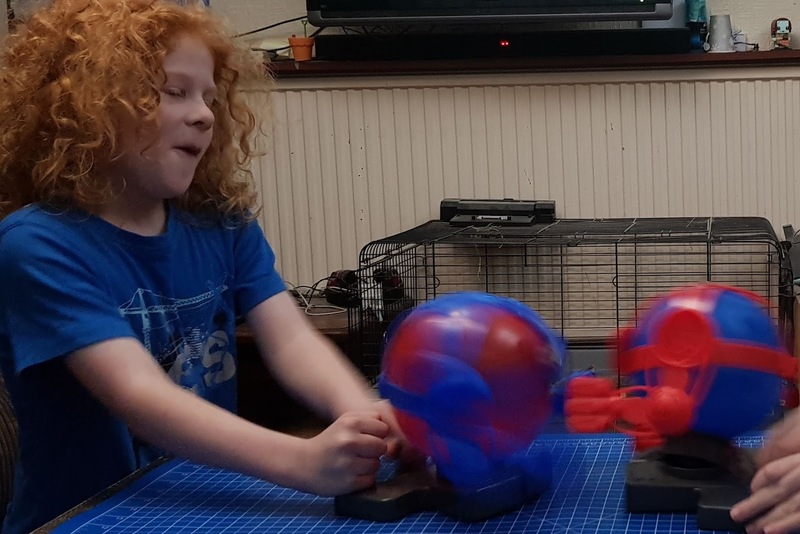 Both players attempt to pop the opponent's balloon and win the match. The hands have a rough sandpapery stripe and skillful players soon realise that friction is what wins the match. 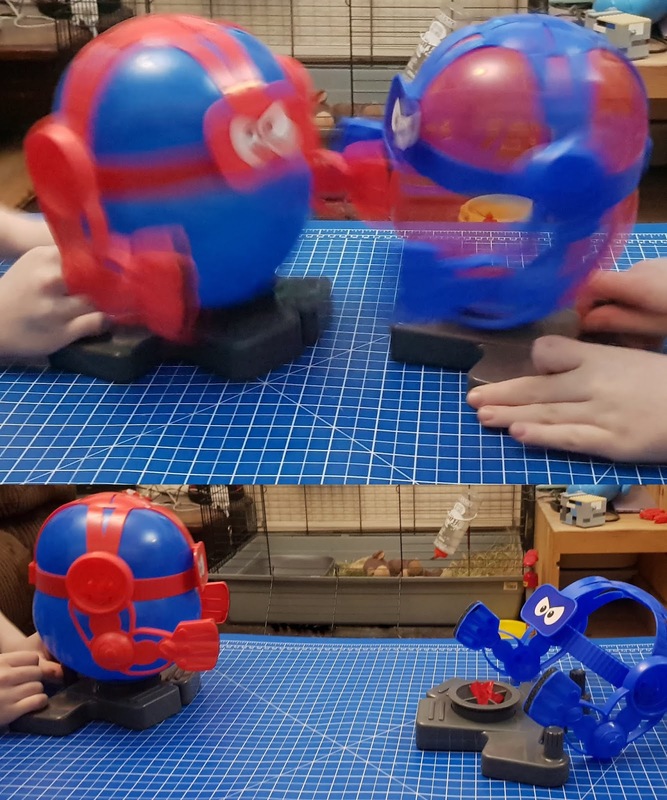 Each match can take anything from 10 seconds to 10 minutes depending on lucky punches and the speed at which you pop your opponent's balloon. It's a great 'warm up' game. It's active, but not too much, so anyone can take part. All ages groups and skill levels have a chance at winning, but you can even learn a few tricks and moves to give yourself an upper hand. An all-round crowd-pleaser. 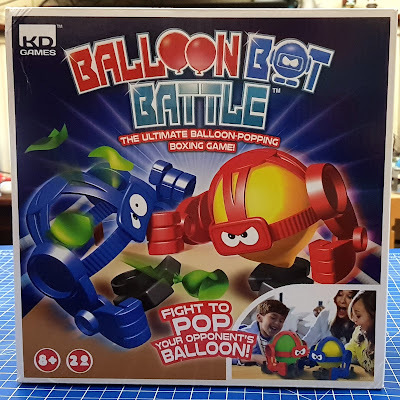 Balloon Bot Battle is available to buy now priced £19.99rrp from all good toy and game shops, including online at Amazon*. For more information about the entire range available see the KD Games website. 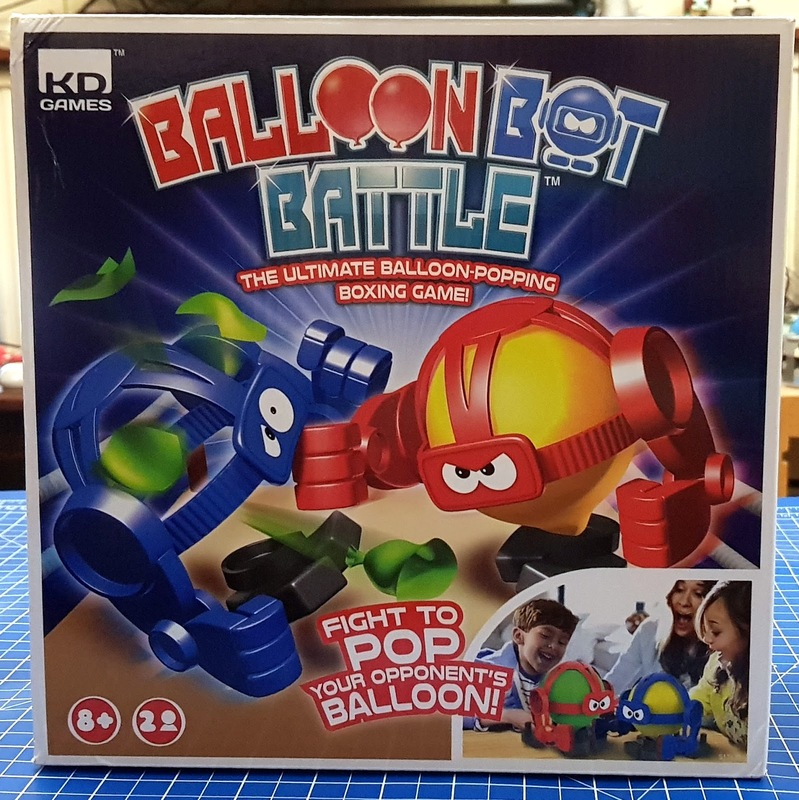 KD Games have also offered a copy of Balloon Bot Battle as a Christmas Present for one of my readers. Entry to the giveaway is by Gleam form below. No entries are mandatory, but each extra task performed earns and extra entry into the random draw. Your personal information will ONLY be used to administrate this giveaway - in fact I'll only look at it if you win! 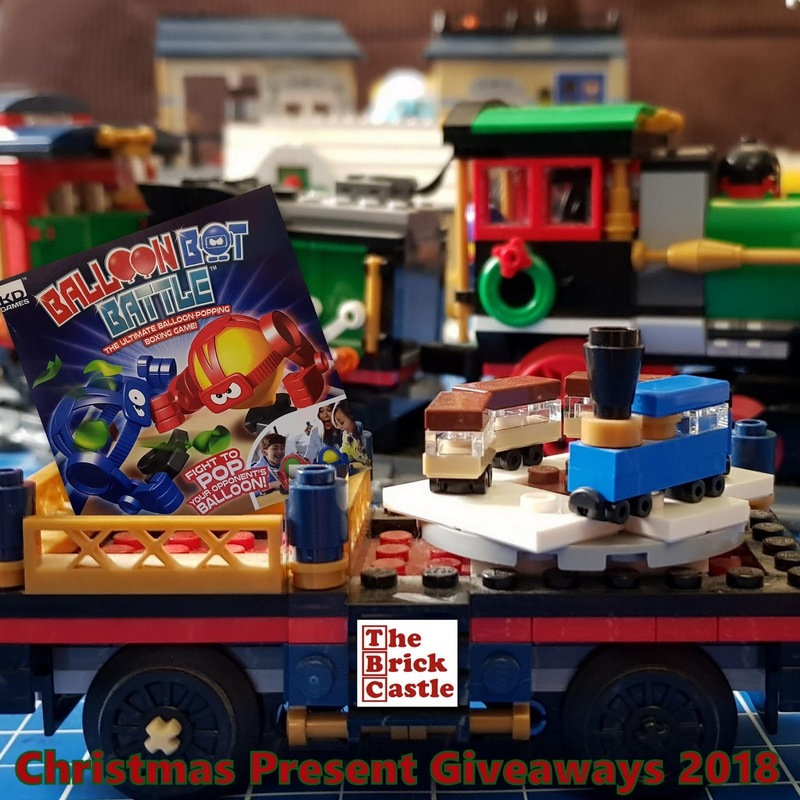 You can find a link to help with Gleam forms and see my other Christmas Present Giveaways here - including lots of other games and books for age 8+. Full terms and conditions are at the bottom of the Gleam form. 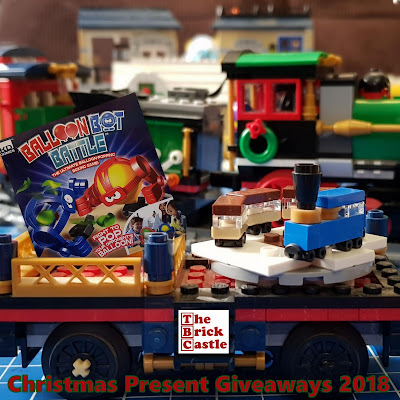 The giveaway is open to UK entrants only and will close at midnight Sunday 2nd December for Christmas delivery. We were sent our copy of Balloon Bot Battle for review. *Amazon links are affiliate, which means I earn a few pence as a thank you for my time if you order through my link, but you don't pay any extra. We don't do anything too exciting, just walk the dogs and play with all of the Christmas toys. On Boxing Day we always go to my parents for lunch and it is ALWAYS Turkey pie and veg (using the left ver turkey) and it is delicious! Apart from that I totally chill and do nothing but watch tv and walk the dog because I am usually tired from Christmas Day itself! On boxing day we tend to go back to my parents for Lunch and then we come home and completely veg out and unwind after all the socialising. to eat way too much and play with all the kids toys!! The kids enjoy playing with their new toys - we watch some family movies, then go over to my parents' house for another Christmas dinner! We eat plenty of leftovers and watch TV. On boxing day we tend to just laze around, I read and the kids play with their toys! We have a quiet day recovering, cold cuts and cheese to eat , board games and family films. We don't have any Boxing Day traditions because I'm back to work the day after and we try to have a bit of a rest! I beat they feel deflated after! On Boxing day my daughter and her family come and we have another Christmas dinner! The men take the boys to football and the girls slob in front of a movie with some chocolates!!!!!! Boxing day for us has to be going for a long walk then coming home to Turkey, pickles and proper chips! We have a family day on Boxing day, playing with all the new things we get, eating leftovers and enjoying a day at home together. Boxing day we stay at home and chomp on all the left over food! We just tend to laze about the house and play with the new toys and watch junk on tv! Well, sadly as we all work in Retail, we tend to work, so we often do stuff in the New Year! Not a lot! If we have money spare, a day of boxing day sales shopping is usually in order, but that won't be the case this year, so probably just a quiet day at home! A quiet one with games, although this year I'm working. We don't really have any Boxing Day traditions other than baking all the Christmas dinner leftovers into a pastry pie - leftover pie! We visit my sister and eat her leftovers. Then we go a long walk in the country side. Eat plenty of food and watch the football. For us, boxing day is a relaxing day when the kids play with their new toys and we just relax, eat and watch some movies. We use this day to catch up with family! We have a large family so Boxing Day is like a 2nd Christmas Day for us. We go for a long walk no matter what the weather. Boxing day is when we take the dogs for a long walk around Kielder and stop in at the pub for a nice lunch. We always have a family get together for lunch and eat the leftovers. We love playing games on boxing day and inviting family around for some food and to join in. I usually spend the day sorting out the girls floordrobes as their floors are usually littered with toys and we spend Christmas day at their nans house so its all systems go. Always a long walk to shed some of the calories from the day before. We spend the day as a family, with films and leftover xmas dinner. We also get chance to enjoy our presents.